Have you ever wondered what it would be like to experience a model cat program? Three UF students recently did just that during externships at Cat Depot in Sarasota, Fla.
Cat Depot is a non-profit, free-roaming center recognized for its progressive design and commitment to helping homeless, abandoned, and injured cats and kittens. 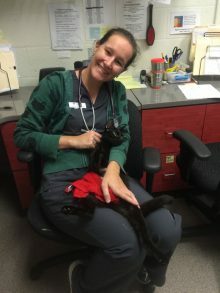 They operate TNR and adoption programs, as well as the Rose Durham Cat Care Clinic, which provides affordable veterinary care to assist sick and injured cats and their distressed owners. “I loved every minute of this externship!” said Kathir. 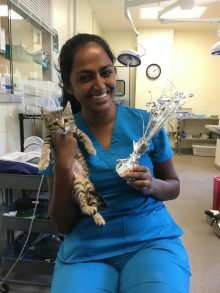 ” I spent most of my time on the shelter side, with a little time spent shadowing over at the Rose Durham Cat Care Clinic. I was given the chance to complete several surgeries, and was able to observe and assist with dentals and other minor surgical procedures. 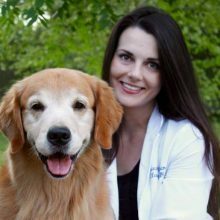 I also spent a lot of time helping out with sick animal exams, including in the isolation wards, and observed and assisted with the intake process. The doctors were very friendly and helpful, and made sure I understood each case thoroughly. Applications for the next Cat Depot externship close Nov. 10, 2017. Learn more here.